It is DC Comics Presents #63, “Worlds to Conquer.” Amethyst Princess of Gemworld meets Superman! Look at that cover, Dark Opal seems to be menacing Superman with some Kryptonite. I love the fact that Carnelian and Sardonyx seem to spend their time locked up in a castle together, plotting and reading magazines. Sardonyx sends Carnelian to Earth, but Amethyst is hot on his heels, blasting through the walls and diving behind him into the portal. Unfortunately Amethyst is quickly transformed back into Amy Winston on Earth. Fortunately the mystical portal has placed her right in downtown Metropolis! Amy doesn’t have her magical powers, but she can still create mystical portals with the power of her necklace, so she tries to get Superman’s attention. I do like the fact that Amy just takes it for granted that Superman will be able to help her. 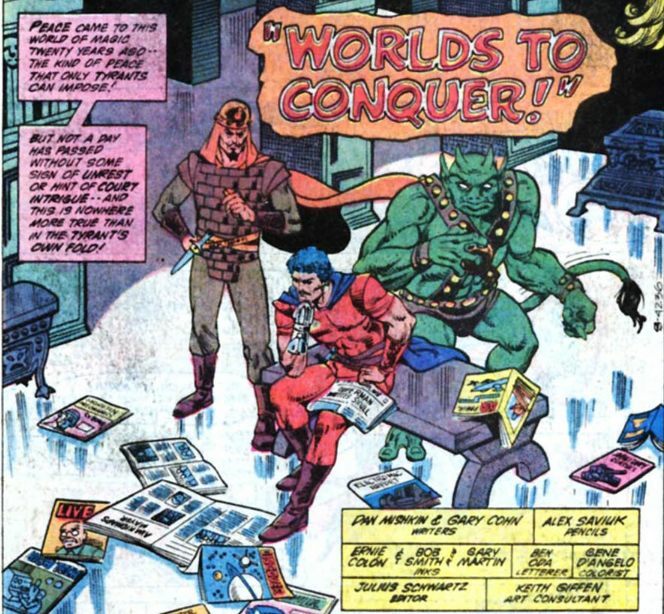 Amethyst Princess of Gemworld was never heavy into DC continuity during the original run, but there were a few touches here and there that showed Amy was a normal teen growing up in the DC Universe – she had Wonder Woman posters up in her bedroom. Amy explains to Superman about the Gemworld, and the fact that Carnelian has come to Earth to execute his latest nefarious scheme. 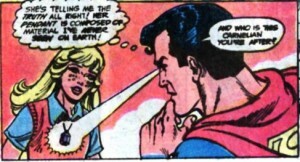 Superman uses his x-ray vision to verify that Amy’s necklace does come from another world. Carnelian being Carnelian, he manages to meet up with a group of super-villains who give him a hand – literally. Carnelian is given a claw that will adjust sizes as Carnelian switches from Earth teen to Gemworld adult. Carnelian was adopted from Earth, so he undergoes the same temporal shift Amy does when she goes back and forth between the worlds. Carnelian is distracted by some shiny Kryptonite. When he picks it up he quickly ages into his adult Gemworld form. This is some very strange Kryptonite, as it appears to give Carnelian the magical powers he lacks on the Gemworld. Superman is about to give up on the search for Carnelian (because he has other super-business to attend to) when Amy is attacked! Carnelian’s Kryptonite-infused magic makes him a formidable opponent for Superman. Who would have thought that? 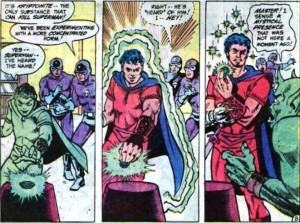 Usually Carnelian is the personification of the word “ineffectual.” He attacks Superman with magic and despite Amy’s advice during the battle, Carnelian manages to overpower the man of steel with mystical flames. Amy leaps to Superman’s defense, yelling “Leave him alone, he’s Superman!” Amy’s teen girl attacking skills aren’t very useful though. Carnelian tosses Superman off the roof of the building, and directs his lizard-ogre dude to kidnap Amy. Amy throws her pendant off the roof as she goes through the portal, determined not to let Black Opal have the source of her power. Superman picks up the pendant and is transported to Castle Amethyst, where he meets the witch-mother Citrina. Elsewhere on the Gemworld Dark Opal isn’t happy about his magic suddenly failing. Ever the tattletale, Sardonyx runs to the dark lord to tell him that Carnelian is responsible. Amethyst has escaped Carnelian and is running away, thinking that the combination of Kryptonite and magic is “affecting the fabric of magical reality.” Superman shows up to help Amethyst and Carnelian whomps him again. But it was just a clever trick! Citrina has sealed Superman’s powers in Amethyst’s gemstone. 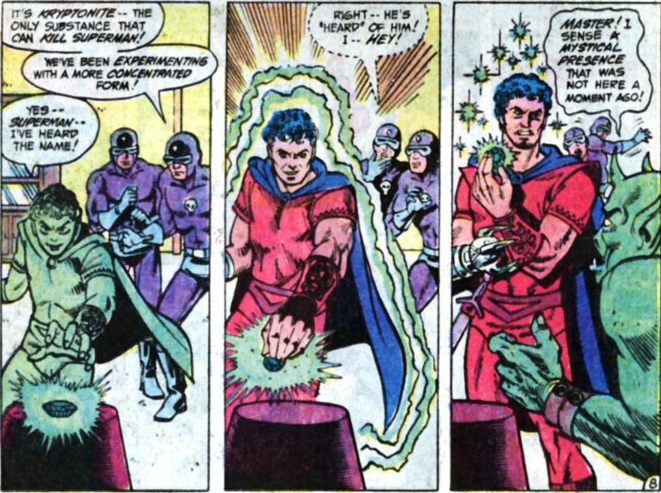 Since Kryptonite only affects Superman when he has super powers, he’s fully capable of punching Carnelian out as a mere mortal. 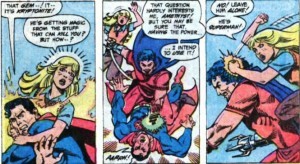 Amethyst returns Superman’s powers and Carnelian yells “I have toyed with you long enough! Prepare to face my wrath!” Superman wonders if Carnelian watches the Late Late Show a little too often when he visits earth. Sardonyx and Dark Opal spy on the battle. Next, Amethyst creates a giant fire engine to mow Carnelian down. Dark Opal joins the battle too. Dark Opal and Carnelian start squabbling over the Kryptonite, so Amethyst is able to rescue Superman. Superman notices that the Kryptonite is growing unstable and comments that if it blows up it might cause a horrible chain reaction. 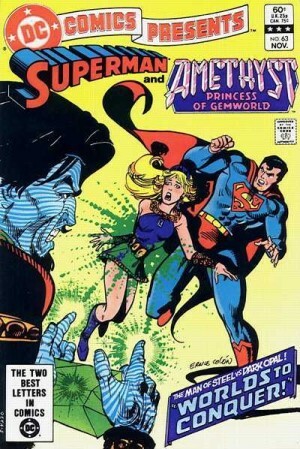 Amethyst devises a cunning plan – she creates a magical duplicate of Superman to distract Dark Opal while the real Superman whizzes by at super-speed, snatches the Kryptonite, and disappears into a portal back to Earth. The Kryptonite explodes in the passageway between the worlds. Superman is safely back on Earth, but he wonders how Amethyst is doing. She sends him a cute thank-you gift. 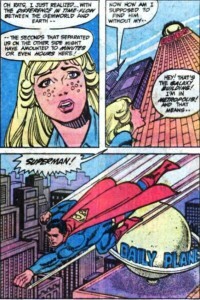 This entry was posted in comics and tagged Amethyst Princess of Gemworld, Superman on 12/26/2010 by Anna.